Klingberg is back. Here's what it means for Dallas - The Point Data-driven hockey storytelling that gets right to the point. 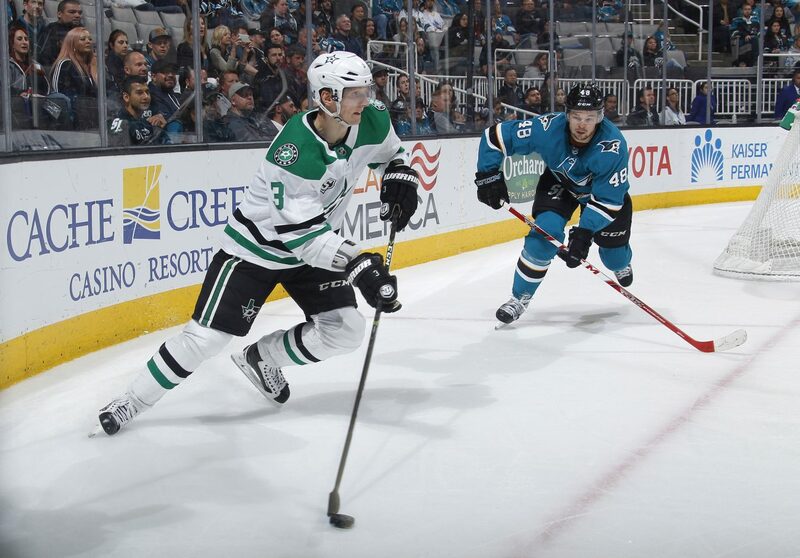 The Dallas Stars get a huge boost to their lineup tonight with the return of stud defenseman John Klingberg, who’s missed the last six weeks with a broken hand. The Stars have been hit with injuries to several top players this year and tonight will be the first time since October 30th that Tyler Seguin, Jamie Benn, Alex Radulov, and Klingberg will all hit the ice together. Klingberg is a big mobile defenseman who is capable of driving the play up ice. He uses his excellent skating ability to create offensive opportunity without sacrificing much defensively. This ability allows him to break the puck out really well and is why he’s possessed the puck at a per game rate more than any other player in the NHL this year. Getting Klingberg back also helps the Stars powerplay that’s been middle of the pack at 15th overall since he went down. His unit of him, Seguin, Benn, Spezza, and Radulov are the fourth-ranked powerplay unit on our powerplay leaderboard, in terms of goals scored per 20 minutes of ice-time. Klingberg walks the blueline with the puck as well as any player in the league and his presence should give the Stars a boost with the man advantage. Klingberg’s impact on this team can’t be understated. Stars coach, Jim Montgomery stated it perfectly when he said, “When he went down, we’ve had a lot of players step up and play really important minutes, but we’ve been a .500 team since he’s been out. We’re not a .500 team when he’s in, so that speaks to his importance to our team.” He couldn’t be more right. The Stars have been 8-8-2 without Klingberg and with him their record is 9-6-1. 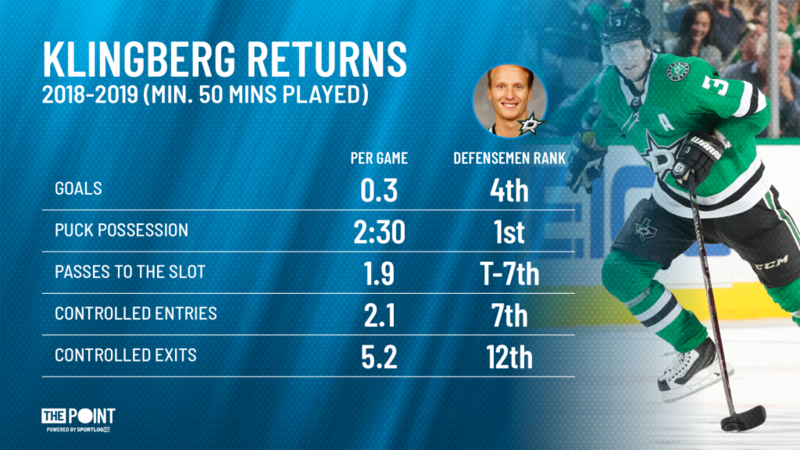 Klingberg’s return couldn’t come at a better time for Dallas. Sitting two points back of Edmonton in the wildcard race with a game in hand, the Stars need their top defensemen to get them back into a playoff spot.